The North Country Maturing Gardener lives, gardens and ages gracefully (we can only hope!) in Northern New Hampshire. 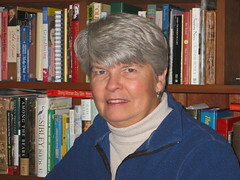 She was certified as a Master Gardener in Connecticut and now, New Hampshire. Aging however, brings limitations...hence the internet vs. the digging! :-) So, come visit and have the North Country Maturing Gardener (NCMG) answer your gardening questions on line! They are SOOOO ugly! The trees look SOOOOO bad with the tents surrounding the crotches and ends of branches. You can almost FEEL the caterpillars crawling all over the trees and nibbling on all the available foliage. YUK! Every time I pass trees laden with with these tents I want to stop and prune them out. But, alas, someone would surely think I was crazy, plus I have neither the time nor energy for that. However, if I see them in MY trees...there'll be heck to pay! There are a few ways you can deal with these guys. Ignore them. Keep your trees healthy and fed and chances are that they will probably survive. Amazing, but true! Scrape off the egg cases in the winter or very early spring (IF you can reach them) before they hatch out. You can just scrape them off with your (gloved) fingers and dump them into a bucket of soapy water, or squash them with your shoe! Treat them with Bacillus thuringiensis (Bt) which is a bacterial insecticide that is kind to bees, other pollinators and friendly insects, but deadly for the caterpillars. Spray the leaves where they will feed, so they get a good tummy full! Remember that these guys come out to eat during the daylight hours. They will generally go back into the tents at night, and even on rainy days. The message here is to spray during the evening or early morning hours. Prune off the tents and put them in a plastic bag for disposal in the garbage. Again, remember to cut them out when all the caterpillars are IN the tents in the evening. It doesn't make sense to prune out the tents when they are empty! You can also spray the leaves with dormant oil spray, JUST as they emerge from their egg cases in the spring as they come out to eat. They will be particularly vulnerable to the oil at that time. Use yellow lights on your outside lighting. That will be less attractive to the moths that appear and lay eggs for next year. No reason to encourage these moths by offering a beacon in the night! I hope I've helped a little. Good luck in getting rid of these "Gawd awful" looking creatures! THERE MAY BE LEAD IN YOUR HOSE! I just read an article in my National Gardening email about the fact that many hoses contain high levels of LEAD! They referred to an ABC article about this and I've linked that here. If you'd like to read a bit more about this issue, click on the link. I don't know about you, but I often take drinks from the garden hose when I'm hot and thirsty. My children did it often and I'm sure my grandkids do as well! The lead levels in most hoses are higher than we'd like to see them be, so use caution if you decide to drink there. Bring a water bottle instead of depending on the hose for a drink. Why is it that we seem to have survived all these "dangers" and yet, we don't want to expose our children to things that are expressly BAD for them, so we need to be alert. At any rate, enjoy the garden and add the water bottle to the long list of things to carry with you into the garden...hat, sunscreen, gloves, long pants tucked into socks, etc., etc., etc. AAARG! you can see what's blooming! Dig potatoes after the tops have died down. Prune off those strawberry runners to keep your strawberry bed orderly. Water any newly planted shrubs and trees. Don't fertilize anymore until the leaves begin to change color. If you fertilize late in the summer, it causes a flush of growth which will probably be "nipped" by frost. So, hold off a bit. Water evergreens thoroughly during dry weather. This is also a good time to sow poppy seeds! August sown seed gives richer-colored flowers, so give that a try. Cut off foliage of bleeding heart, which has probably become unsightly. Apply fertilizer around peonies and scratch it into the soil. If you want to transplant or divide them, this would be the time. Treat for Powdery Mildew. Try this recipe: 1 1/2 tablespoon baking soda, 1 gallon of water and 2-3 tablespoons of horticultural oil. Spray it on all the susceptible plants every other week or so. Plant colchicum's and fall crocuses. Order your bulbs if you haven't already! Are you remembering the lawn mower should be set at 2 1/2 to 3 inches to help the grass stay hydrated? Cutting the grass lower will be very stressful! Still time to sow lettuces and greens, carrots, beets and turnips (don't worry about how big they get...they ALL taste wonderful while still immature!) Then of course, there are radishes. Be sure to keep all of these well watered, also, a bit of mulch will keep the tender roots cool. As far as avoiding early frosts, a row cover will help there! Get some netting over the blueberries! Remember the birds and small animals are great at crawling UNDER and THROUGH the netting. Try staking it so they can't reach the berries from the outside. If they get in, you'll live to regret it. Talk about a mess!!! Have you got Hosta's? Are there slugs chewing them? Try this solution, if you haven't already. Combine 9 parts water to 1 part common household ammonia and spray it on the hosta just before dark. When the slugs hit this, they will dissolve! I hope gardeners will visit to get gardening information and ideas. I post monthly chores as well as give an idea of what's happening in my garden as the year evolves. 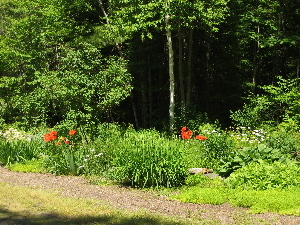 It is geared toward Northern New England gardens. I hope you'll visit often! Greetings from the Pacific Northwest! GARDENING CHORES FOR MARCH AND A BIG MOVE! CAN I STILL PLANT SPRING BULBS?